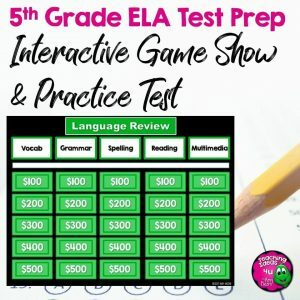 Each unit includes activities, vocabulary, and assessments. 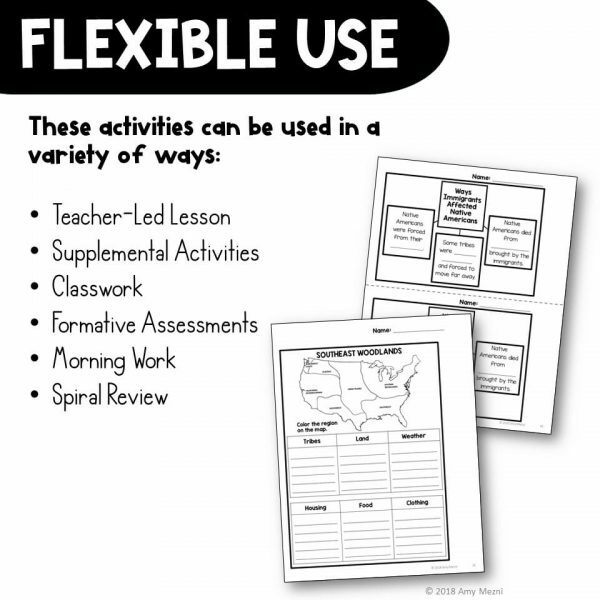 These activities can either be used with a textbook or used as a teacher-led unit. Some activities also include links to related outside sources that teachers could use. 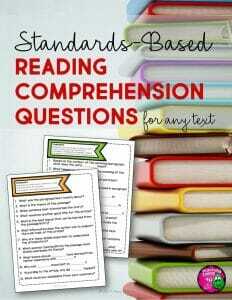 Activities include an essential question, vocabulary, short response, graphic organizers, and tables. Each unit includes 3-4 summative assessments. A complete answer key is included in each unit, including photos of each completed page. This unit was designed with 2nd graders in mind. 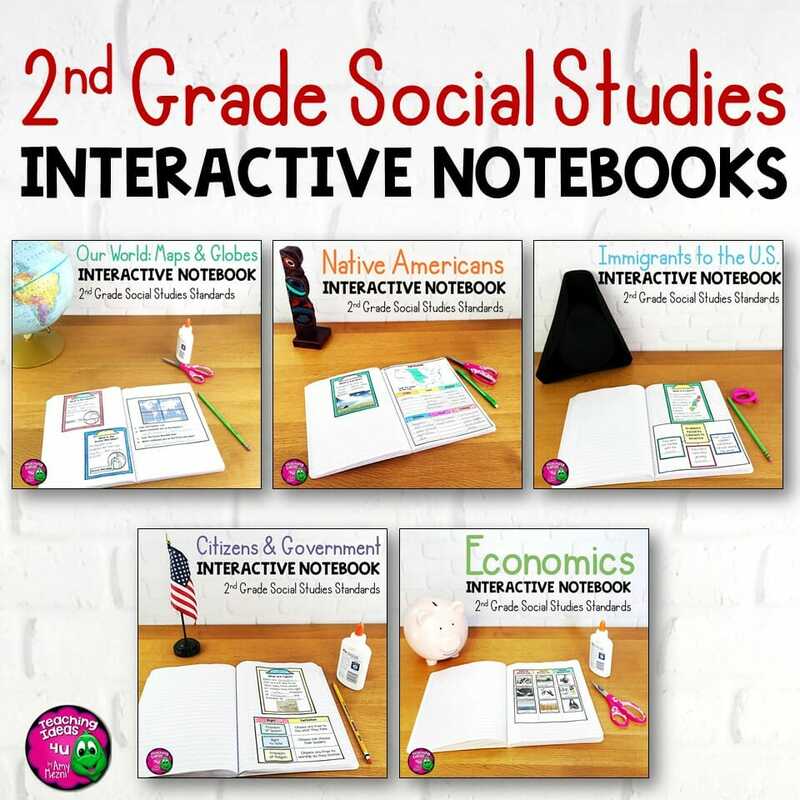 The activities can either be used as whole-page printables or cut and glued into a notebook. 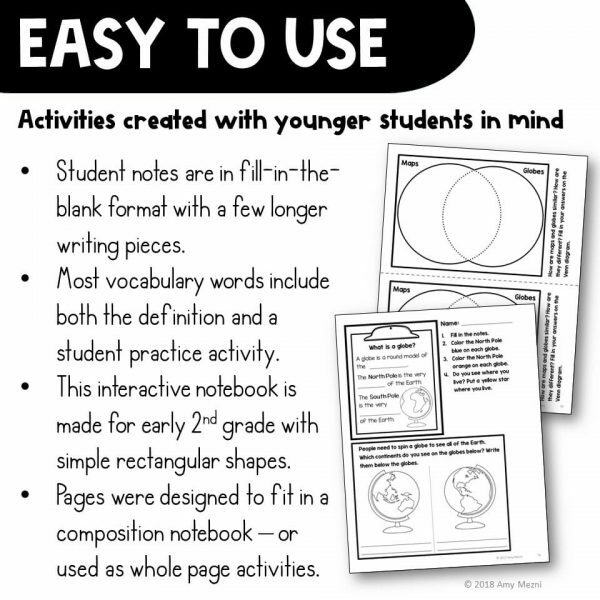 As many primary teachers use composition books, the activities were designed to fit their smaller pages. 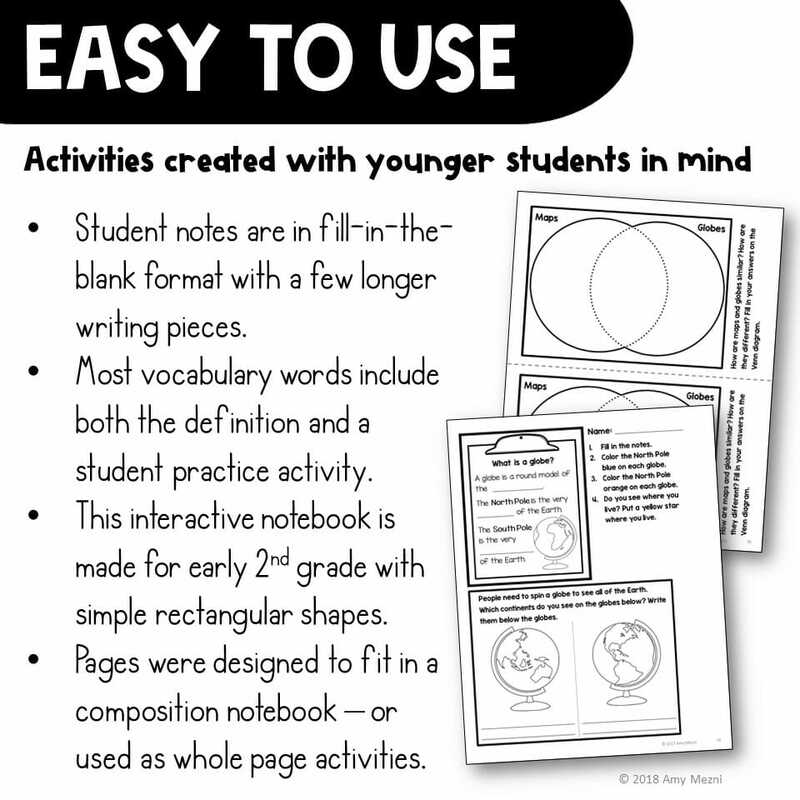 The shapes to cut are simple rectangles – and students just glue them on the page. 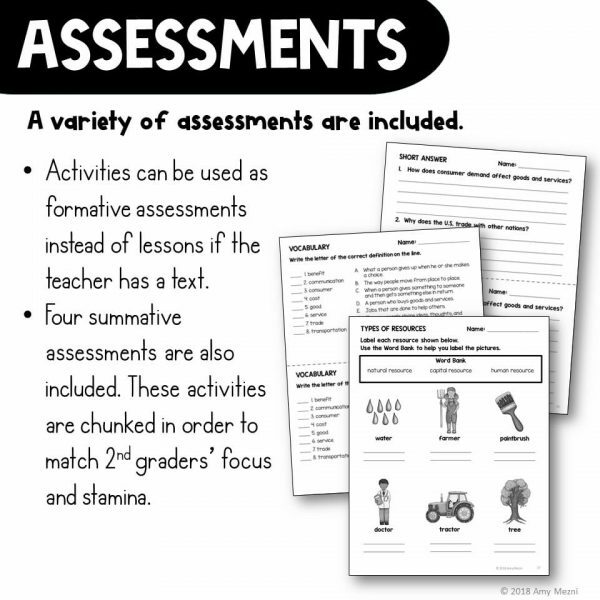 The summative assessment was broken into smaller chunks in order to accommodate shorter attention spans. A unit title page including title and table of contents is also included. 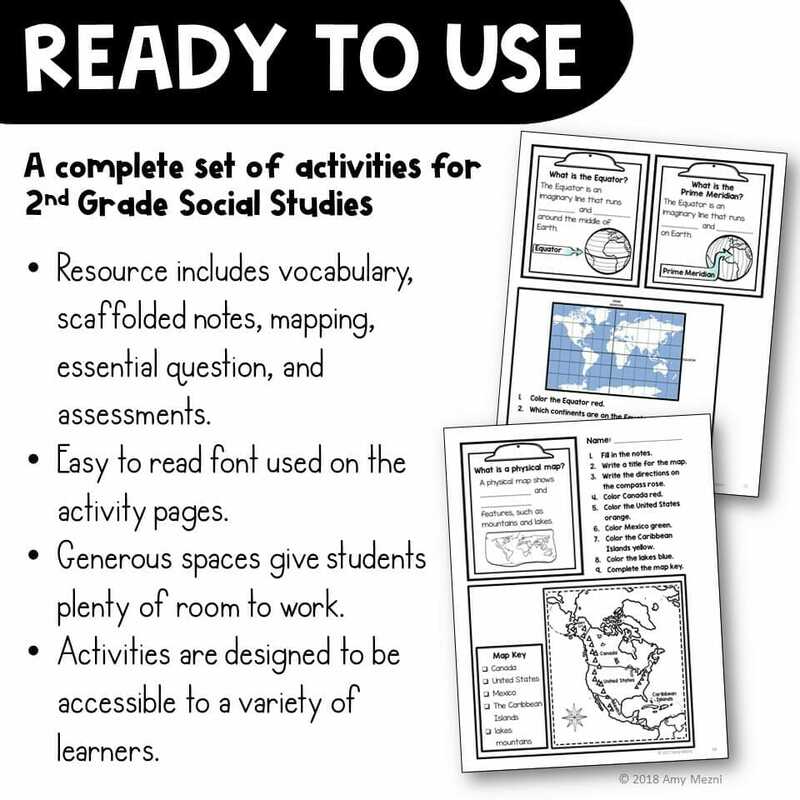 Students will use different types of maps (political, physical, and thematic) to identify map elements. Students will identify their hometown, Florida, and North America on maps and globes. Students will locate the state capital and the national capital on maps and globes. Students will label on a map or globe the continents, oceans, Equator, Prime Meridian, North Pole, and South Pole. Students will use a map to locate the countries in North America (Canada, United States, Mexico, and the Caribbean Islands. 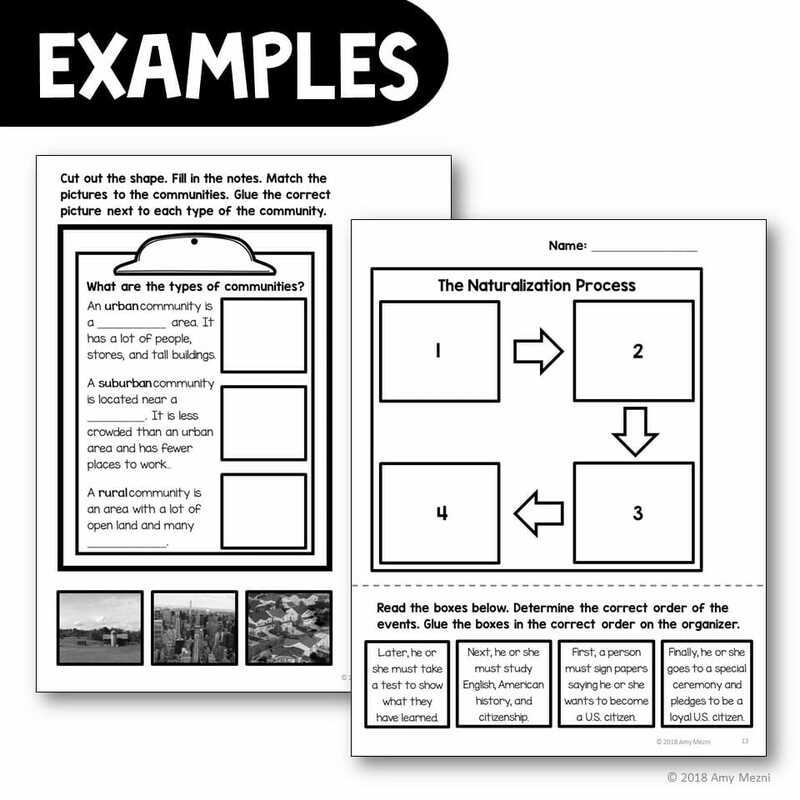 Students will recognize that Native Americans were the first inhabitants of North America. Students will compare the cultures of Native American tribes from various geographic regions of the United States. Students will understand the impact of immigrants on Native Americans. Students will explore ways the daily life of people living in Colonial America changed over time. 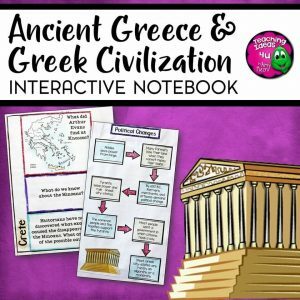 Students will identify reasons people came to the U.S. throughout history. Students will discuss the importance of Ellis Island and the Statue of Liberty to immigration from 1892 – 1954. Students will discuss why immigration continues today. Students will explain the cultural influences and contributions of immigrants today. Students can identify terms and designations of time sequence. Students will explain why people form governments. 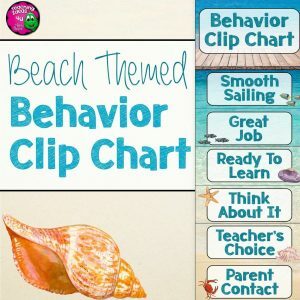 Students will explain the consequences of an absence of rules and laws. Students will identify what it means to be a U.S. citizen by birth or by naturalization. Students will define and apply the characteristics of responsible citizenship. Students will explain why U.S. citizens have guaranteed rights and identify those rights. Students will identify ways citizens can make a positive contributions in their community. Students will evaluate the contributions of various African Americans, Hispanics, Native Americans, veterans, and women. Students will identify the Constitution as the document which establishes the structure, function, powers, and limits of U.S. government. 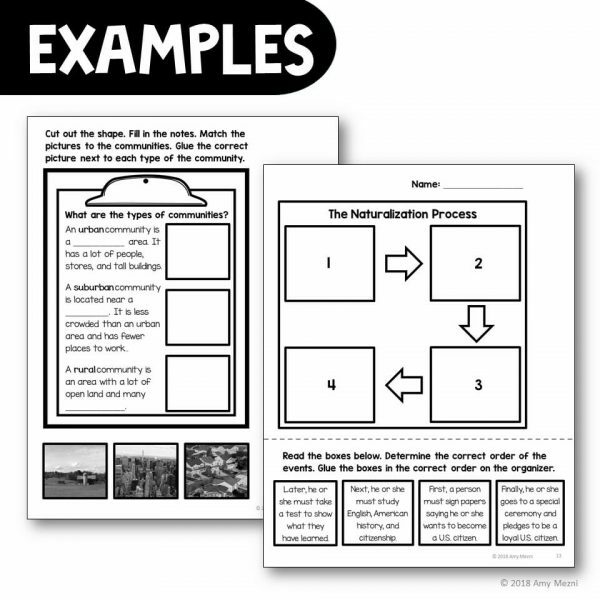 Students can recognize symbols, individuals, events, and documents that represent the United States. Students will recognize that people make choices because of limited resources. Students will recognize that people supply goods and services based on consumer demands. Students will recognize that the United States trades with other nations to exchange goods and services. Students will explain the personal benefits and costs involved in saving and spending.